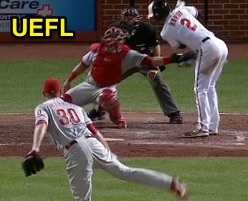 HP Umpire Lance Barksdale ejected Phillies P Justin De Fratus for throwing at Orioles batter J.J. Hardy in the bottom of the 6th inning of the Phillies-Orioles game. With none out and none on, Orioles batter Chris Parmelee hit a 1-0 fastball from De Fratus for a home run. Ensuing batter Hardy took a first-pitch fastball from De Fratus for ball one. Replays indicate the pitch was located inside and thigh high, the call was irrecusable. At the time of the ejection, the Orioles were leading, 15-3. The Orioles ultimately won the contest, 19-3. This is Lance Barksdale (23)'s first ejection of 2015. Lance Barksdale now has 3 points in the UEFL Standings (1 Previous + 2 MLB + 0 Irrecusable = 3). Crew Chief Gary Cederstrom now has 3 points in Crew Division (2 Previous + 1 Irrecusable Call = 3). This is the 93rd ejection of the 2015 MLB Regular Season. This is the 45th player ejection of 2015. Prior to ejection, De Fratus' line was 1.0 IP, 2 ER, HR. This is the Phillies' 3rd ejection of 2015, T-2nd in the NL East (WAS 5; ATL, PHI 3; NYM 2; MIA 1). This is Justin De Fratus' first career MLB ejection. This is Lance Barksdale's first ejection since May 14, 2014 (Lloyd McClendon; QOC = Y [Check Swing]).